Store, protect, and manage all your important documents safely and easily in PaperCraft's record storage boxes. 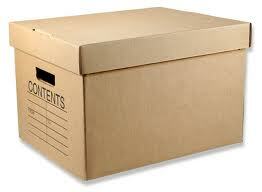 Whether for long-term archiving, office moves or trial preparation, our records storage boxes hold up under the most strenuous conditions. What makes PaperCraft's storage boxes different than the competition? Several important features differentiate our boxes from others. First, one-step, pop-up assembly means they're put together in seconds. Second, double-walled construction means a 700lb. stackable weight capacity--among the industry's best. And third, heavy-duty tray top lids mean easy access and the ultimate protection of your records.